There are many brands of head collar (such as the Halti and Gentle Leader), but they all work basically the same way: by turning your dog’s head when she hits the end of the leash, you can redirect your dog easily, and discourage pulling on walks, barking, and lunging. They work essentially the same way a head halter does on a horse. 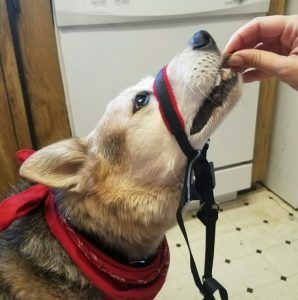 A head collar generally takes about a week to teach your dog to wear, by a) getting him used to the feeling of it on his nose through gradually increasing the time he will wear it, and b) pairing the head collar with his favorite things. In time, the head collar will become the predictor of good things to come, and your dog will enjoy wearing it. Pro Tip: Before you begin, have your trainer adjust the head collar properly – if they’re not fitted properly on your dog, they don’t work properly. Step 1. Allow your dog to see and sniff the new collar. Follow his exploration up with a treat. Step 2. Make a “duck beak” with your hand, and hang the head collar over it. Put a treat in the “duck’s beak” (between your forefinger and thumb). Allow your dog to eat the treat as you slide the nose loop over his nose. Immediately remove the nose loop once he’s eaten the treat. Tell your dog he’s a wonderful, brave dog! Pro Tip: If you angle your dog’s head up using the placement of your treat hand, gravity will keep the nose loop on longer. Step 3. Repeat Step 2, but use a bigger treat, so your dog has to chew it a little. 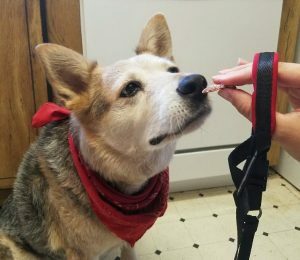 Slide the nose loop over your dog’s nose as before, then follow the neck straps around and fasten them behind your dog’s head. Pro Tip: a Gentle Leader’s neck straps should sit just below the bump in the back of your dog’s head, and be quite snug. A Halti’s neck strap is looser and sits lower down on the neck, closer to the collar. Again, ask your trainer to help you if you’re not sure. Feed your dog a few more treats and praise him generously, then un-snap the head collar and allow it to fall off your dog. Pause for a few seconds, then do it again. Make the treats and praise happen whenever your dog is wearing the head collar, and try to be boring when he’s not. Repeat until you and your dog are both comfortable putting the head collar on and taking it off with little struggle or confusion. Step 4. Once or twice a day, for a couple of days, pair the head collar with one of your dog’s favorite activities, such as his meals, training time, fetch, or tug-of-war. The idea is to choose an activity so exciting, your dog doesn’t care that he’s wearing a head collar, and he has a great time. The one exception is walks – don’t walk him in it just yet! Remember to keep your sessions short and sweet. 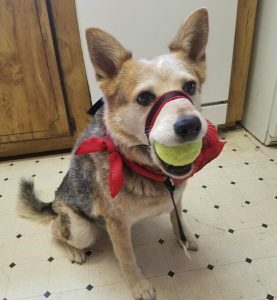 Safety tip: If your dog’s favorite activity is something active, like fetch, make sure to tuck up any hanging straps so he can’t accidentally trip on them. Step 5. 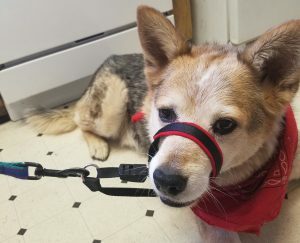 Attach the leash, and help your dog to understand that if he feels pressure in one direction, that means he should give to the pressure for his reward. Gently pull the head collar to the right, and when your dog’s head moves to the right, praise and reward him! Repeat for the left side. Gently pull the head collar upward, and when he moves his head upward, praise and reward! Step 6. Go for a walk! Keep your pace quick to make it exciting for your dog. Remember to keep it short and sweet at first. When your dog hits the end of the leash, stop walking. 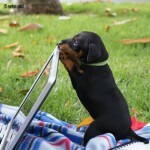 Help him to loosen his leash by calling his name, patting your leg, taking some steps backward yourself. Once the leash is loose again, keep walking. If your dog stops to fuss with the head collar or try to rub it off, keep walking. Everyone’s response is to stop and watch the dog do this, but if you keep walking at a fast clip, your dog needs those legs to walk more than he needs to itch at the head collar. Keep the leash loose. 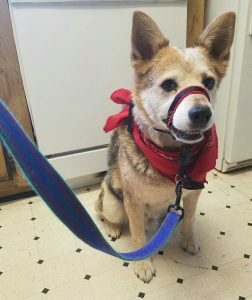 If you tighten the leash, or have a death-grip on it the whole time, you’ll just end up dragging your dog around by the face, and not only is that miserable for both of you, but your dog will never learn to walk on a loose leash. Your dog should have enough leash that when he’s standing where you want him, there’s a distinct U- or J-shape in the leash. Do not perform leash corrections on a head collar (no jerking or yanking). If you need to turn your dog around, your movements should be smooth and gentle. Think about guiding a horse – no yanking, just gentle guidance. Never use a head collar with a long line or retractable leash, like a Flexi. If your dog sees a bunny and takes off running, and suddenly hits the end of the leash, you could seriously injure his neck. Use your head collar with a fixed-length, 4 or 6 foot leash. Use a flat collar, or better yet, a harness, for longer leashes.